Diesel Rail Car Services, poster, 1960. BR(ER) poster. 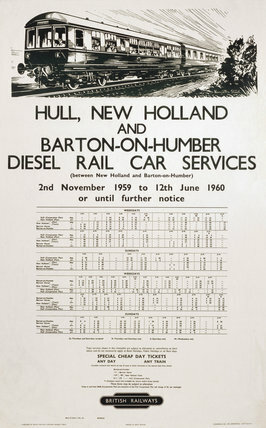 Hull, New Holland and Barton-on-Humber Diesel Rail Car Services, 2 November 1959-12 June 1960. Artwork by Kenneth Steel. 'Isle of Man', BR (LMR) poster, 1948-1965. 'Dunfermline', BR (ScR) poster, 1959. 'The Percy Tomb, Beverley Minster', BR poster, c 1960. 'Buxton', BR (LMR) poster, 1950. 'Service to Industry - Steel', BR (NER) poster, 1963. 'Suffolk for Sunshine', BR poster, after 1948.